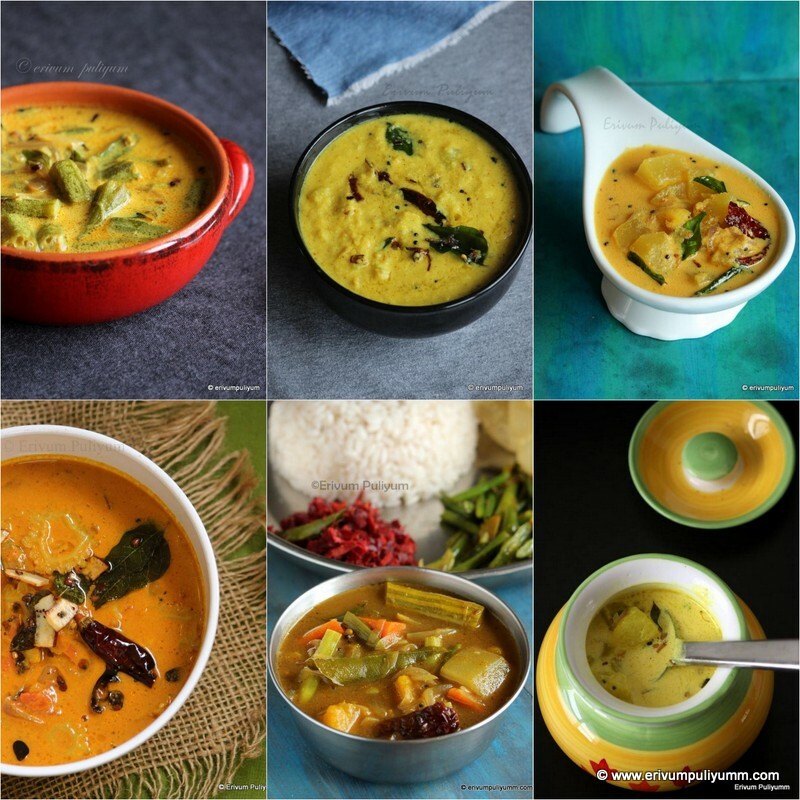 I remember the time I started blogging about 10months ago,never did I thought blogging was so much fun filled and continous activity.Am happy to have many friends in this blogging world,a total new place and space..And Yesterday,was a big day for me for two things- first it was my first guest post featured by Ms.Wan @ Cooking Varieties and second it was my birthday !! 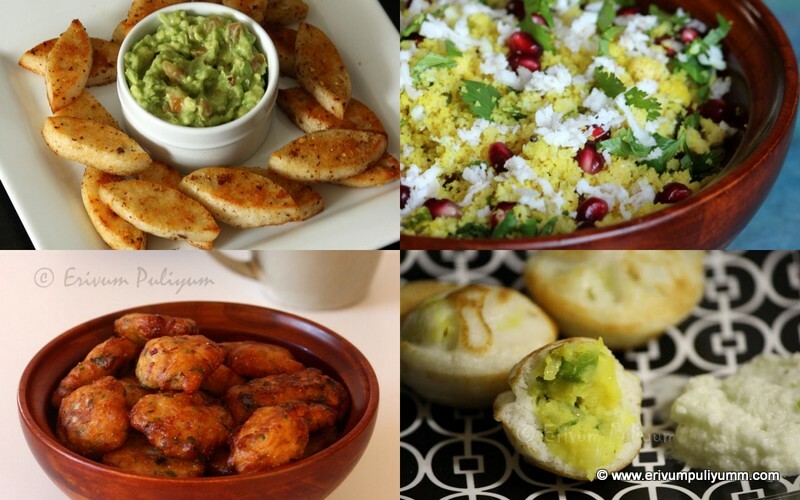 The guest post featured is Chicken Tikka recipe,a lovely recipe which my family loves a lot . I was very happy to know that Ms.wan had posted it on my birthday in her space and when I informed her about the birthday,she immediately put up a beautiful birthday card.Thank You so much ,Ms.Wan,just loved it !! Ms.Wan is a very experienced blogger and a very good friend of mine.She has lot of information about healthy eating habits,Beneficial nutritional facts of fruits and vegetables ,a lot abut variety of flowers and plants and some times she puts up some cooking jokes to relax..Love to read all her posts,wish her all success in the blogging world too and Friends,do visit at her lovely space and the link put up to my guest post is here. 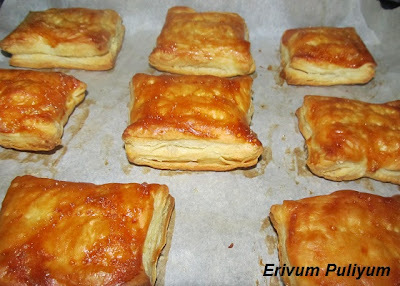 Coming back to today's recipe..Another wonder baked snack from puff pastry sheet.puff pastry sheet leave us a lot of choices .Kids will surely love this and an easy way to sneak fruits to their diet.I just loved the tasty filling and hope you will love this to!! -Wash ,peel and core the apples.Grate the appes on the large holes of grater. Add in the lemon juice and keep aside. -Melt 2 tablespoons of butter over medium heat in a sauce pan. Add the grated apples and toss until coated. -Add the brown sugar, flour, lemon juice, cinnamon, and salt. Continue to cook stirring frequently, until the mixture is thick and syrup(took about 10 minutes). Remove from heat and stir remaining 1tablespoon of butter. Cool the filling . -Thaw the oastry sheet as per packet instructions .Unfold the sheet onto a floured surface. Roll out the pastry to form a very large, thin rectangle. Using a sharp knife or pizza cutter, cut out 16 small rectangles or 8 bigger rectangles. 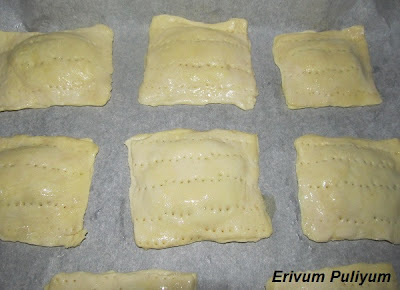 -Place hallf of the rectangles to a parchment-lined baking sheet. Spoon 2 tablespoons of the apple filling into the center of the rectangle. Spread the filling evenly across the pastry, leaving a 1/2-inch space clean around the borders. -Place the other rectangles n top and seal all sides.Brush the top with egg wash.Continue with the rest of the rectangles. Prick each strudel all over with a fork, including the sealed edges. -Bake the strudels until puffed and golden brown, about 25-30 minutes. Cool for 15 minutes on a wire rack before eating. Frost and serve warm. 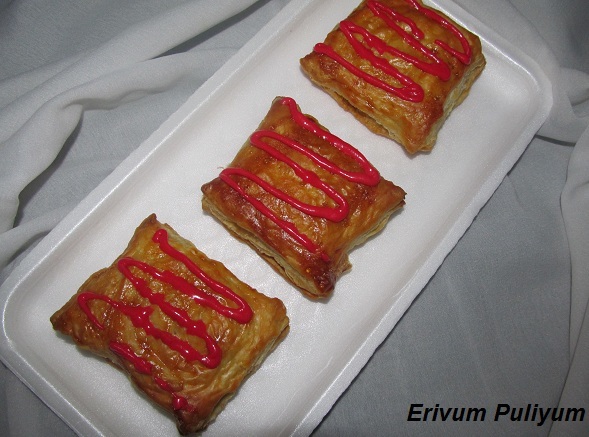 -For the icing, I used ready made red icing.Pipe the icing using a ziploc bag in desired shapes. Beat the cream cheese, powdered sugar, and vanilla extract together. Spoon the glaze into a small Ziploc bag and seal. Snip a small hole in one corner of the bag and pipe desired amount onto each pastry. Happy Blogging and Have a Great Day!! Congrats on ur guest post..apple cinnamon toaster struedel sounds great n looks very yummy..
Belated Happy Bday and hope you have a wonderful year ahead..this is yet another awesome baking recipe from you! Belated happy bday and hope you have a wonderful year ahead..this yet another awesome baking recipe from you! 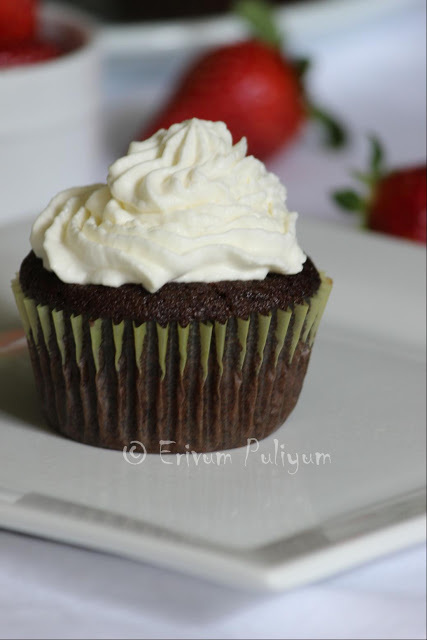 Lip smacking puffs n perfectly done dear,thanks for sharing!! 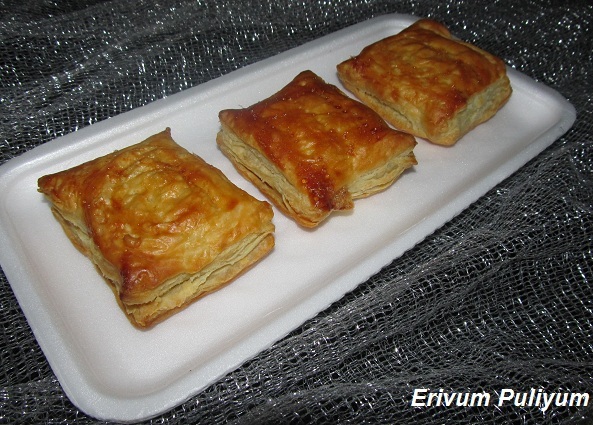 Apple Cinnamon strudel is so nice :) I just got some puff pastry sheets and planning to make something sweet! This seems so perfect! It was our wedding Anniversary yday and your bday - Coincidence :) And we are like minded maybe I'm Capricorn too born on Jan 2nd..
hi Julie, wow! your apple strudel look soooo delicious, i can learn make this from you- bookmarked with thanks..
How was your birthday yesterday, the strudel must be a birthday party dessert huh. they even your beading beads blog. Many many happy returns of the day,dear!!! Looks delicious Julie. Have added to your GFC. Pleasure following you. Awesome preparation, Julie...Looks so inviting. Happy Birthday! These, as well as your chicken, look great! Congrats on your guest post and Belated Birthday Wishes Dear. mmmm... looks very yummy and perfectly done. Omg, super tempting guest post, well done Julie. 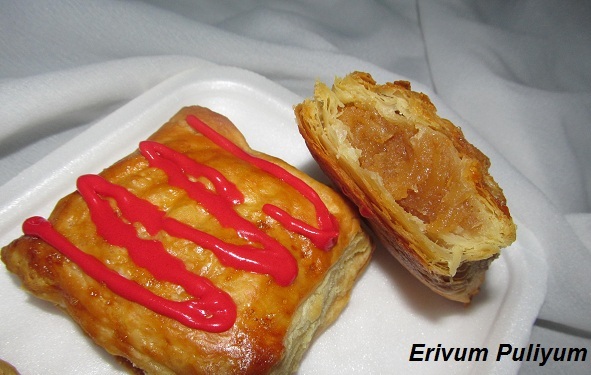 The apple strudel looks yum... going to Cooking Varieties website now.. Happy birthday Julie..It is so sweet of Wan to post ur recipe on your birthday. These sweet puffs are awesome..
Belated Birthday wishes to you Julie..
Congrats on ur guest post too..
snack looks really very good n delicious too.i must try for my kids. HAppy Birthday to youn Julie! This looks really tasty good. Going to visit you Mrs Wan. It must taste great.Delish done Strudel.Oh Yum Yum.Awesome recipe Dear. Congrats on your guest post & belated birthday wishes to you! Yummy post... Looks fabulous! Thanx all for your warm wishes on my birthday :-) n your sweet comments..
Belated birthday wishes Julie.Strudel looks delicious.